We’re excited to be partnering with the Sion Storm Dance Team and the Lee’s Summit North Northern Stars to host 2 one day clinics! It’s a local opportunity that is an affordable alternative or enhancement to a larger camp experience! A discount is also offered to teams that have attended prior clinics and/or the Kansas City Classic. At our clinic we will teach you a total of 6 routines that are fun AND fit to perform at pep rallies and athletic events for your school. Routines include transitions, visuals, and different options so that you can make the material fit your team. We keep the routines true to the assigned ability level, but no routine is a throw away! You’ll be able to perform it at home! It’s been a thrill to see video performances of the material taught at our clinic, whether it was the full routines, or even the hip hop sidelines incorporated into full length routines! We’ll also include a warm-up routine that you can utilize at practices to strengthen the all important core muscles, and improve cardio conditioning and flexibiltiy. The coaches aren’t forgotten. They go home with information they can use to help them as they work with their teams, tips for planning a successful year and perfecting routines. We strive to be a helpful and supportive local resource to coaches and teams, and your attendance at our clinic will be a good start to, or a continuation of, relationship building and networking, not just with Larkspur, but with other coaches as well. Team members make great connections too by dancing with other school teams! Each team goes home with flash drives of all the music used at the clinic, and the music is compliant with copyright laws. Routine instruction and performances can be videotaped to help with memory. All dancers will receive a free souvenir aluminum Larkspur water bottle! New this year due to a need expressed by coaches: the addition of 2 leveled technique classes to improve turns and leaps for beginners all the way up to advanced dancers. The Larkspur staff has loads of experience, but most importantly, we love to teach and we love working with dance teams and their coaches! 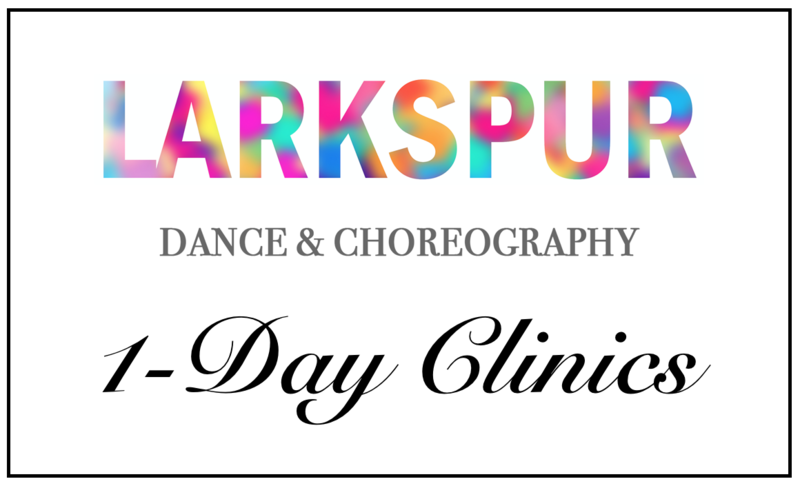 We hope you’ll take advantage of our clinic that has a proven track record for providing great material and a positive experience for your dancers!